It can happen to anyone. One minute everything is going just fine; the next you have a dental emergency on your hands. Whatever you do, don’t panic! Remain calm and call your dentist. They will help you get through it and give you the treatment you need. Whether you can see your emergency dentist immediately or not, there are some simple steps you can take to help make treating your dental emergency with a dentist go smoother. In many of these cases, time is valuable to get the most effective treatment, so don’t wait to seek help! What can I do on my own to manage the dental emergency until I see a dentist? If your tooth is knocked out, keep it moist at all times. Avoid touching the root, and if you can, try placing it back in its socket. If that’s not possible, keep it between your cheek and gums or in milk. For a cracked tooth, rinse your mouth with warm water immediately to keep the area clean. Use a cold compress to keep swelling down. If you bite your tongue or lip, clean it with warm water and use a cold compress on the area. If you have a toothache, rinse your mouth out with warm water to help clean it out. Then try to gently floss around your teeth to remove any food that may have been stuck between them. Avoid putting aspirin on the aching tooth or gums. Even if your dental emergency doesn’t occur during office hours, some dental offices provide a 24-hour phone service to connect you with someone who can provide advice for managing your situation until you can go in for treatment. When should I go to the emergency room for a dental emergency? Seek immediate medical help if you experience heavy oral bleeding, facial swelling, a severely damaged or broken jaw, or other such situations. If something like this happens, the priority shifts to your safety and overall recovery. Once you’ve addressed the major problem, you can go to a dentist to fix any remaining issues with your teeth. 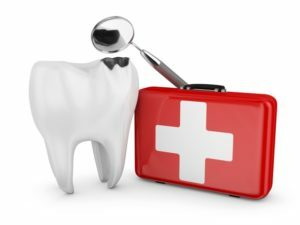 How can I prevent a dental emergency from happening in the future? Not all dental emergencies are preventable. However, some are. For example, when you play contact sports like football, basketball, or lacrosse, wear a mouthguard. Also, avoid chewing ice, popcorn kernels, and hard candy. Never use your teeth to open or cut things. Find a pair of scissors instead. These simple steps can help save you the pain and stress of a dental injury or emergency. No matter the dental emergency you’re facing, make sure you contact your dentist to schedule the next available appointment. The sooner you address the problem, the sooner you can feel relief and assurance that your smile will be healthy again. But even if you have to wait for your appointment, you have the capability to act and help make your recovery that much more successful. Dr. Prachi Shah has been practicing dentistry since 2007. Dedicated to lifelong learning, she has completed post-graduate training in pediatric dentistry and orthodontics, as well as continuing education in numerous dental specialties. Dr. Shah holds certifications in Pediatric Advanced Life Support and Level 1 and 2 oral sedation. In her practice, South Arlington Dental Care, she offers a 24/7 hotline that her patients can call in case of a dental emergency.